This is the SMALLs home for the internationally-renown GEORGE GEE SWING ORCHESTRA from New York City. While he was a Freshman at Carnegie Mellon University (1978) in Pittsburgh, Pennsylvania, George Gee launched his Make-Believe Ballroom program (named after the vintage Martin Block show) on the college radio station - and told everyone who’d listen about his dream of leading his own big band. In an era when punk, new wave and heavy metal ruled, some first thought that George was revisiting the past. Thirty-five years later, it is delightfully clear that George was just way ahead of his time! 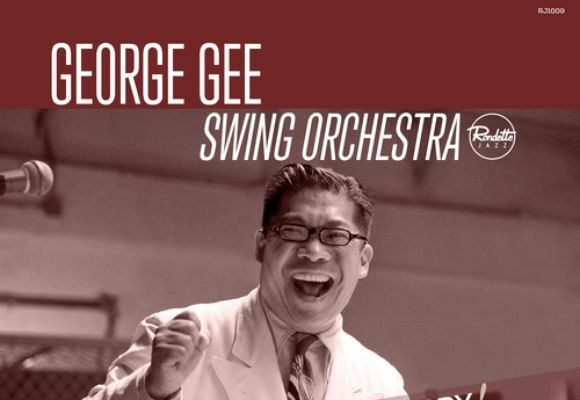 The only Chinese-American professional Swing big band leader, George Gee is unique in so many ways. The snap in his fingers, the shuffle in his step and that unbridled joy he radiates and spreads like ecstatic wildfire to all his world-class musicians make immediate and permanent impressions on audiences of all types! It must be in his blood since he was a kid, all George ever wanted to do was lead his own big band. A native New Yorker, George always loved music. He grew up with rocknroll and R&B but also developed a powerful passion for Swing - especially for the big band styles of Count Basie, Duke Ellington, Lionel Hampton, Glenn Miller, Tommy Dorsey, Benny Goodman, Cab Calloway and other legends. At renowned Stuyvesant High School, George wowed the crowds with his flashy bass showmanship in the schools jazz band. His college radio show at Carnegie Mellon Univeristy in Pittsburgh was a huge hit! The station asked George to interview his idol - William "Count" Basie - before a campus concert. That extensive, exclusive conversation would change George’s life forever. The next day, he assembled his own 17-piece big band - the George Gee Swing Orchestra! Staffed by student players, the band quickly became the darling of the campus community. Throughout the 1980's, George spread his swing gospel throughout the Pittsburgh tri-state region - from rowdy frat houses to black-tie society galas, corporate events and top nightclubs. But George knew what he needed to do next. He returned home to New York City in 1989, and summoned top New York-based musicians - young and older veterans of the worlds most legendary big bands - and Latin and pop giants - to continue living his dream. With each performance, Georges powerhouse 17-piece Swing Orchestra continues to set new standards elegantly balancing the genuine big band tradition with exhilarating modernism. His 10-piece Swing Orchestra, formed in 1998, puts a new twist on big band favorites and delivers all-out rollickin roadhouse boogie! With this group, which George lovingly calls his Economy Big Band, they have been able to travel around the United States and the world headlining swing and lindyhop dance events. George also revels in his stature as a veritable Ambassador of Swing. George is a much sough-after authority on the evolution of the art. He has lectured at the New School University, led clinics and master classes - and is a popular source for newspaper, magazine, TV and Internet reports. George also served as a primary expert for the 2000 nationally broadcast BRAVO documentary "This Joint is Jumpin', featuring extensive interviews throughout the two-hour film. Throughout 2015, George is celebrating his 35th Anniversary in the Big Band Business, and looks forward to an even brighter and more illustrious future. "People have asked me lately what Ill do now that the swing fad that grew a few years back has subsided. The question makes me smile, because when I started in 1980, everyone thought swingin' was about as much fun as pullin' teeth! We've traveled a long road many long roads and I'm proud to say that today, swing music, jazz, and the Big Band art form are not only alive and well, but enjoying their widest popularity since their heydays." Still full of joy and energy, this diminutive gentleman of swing and his merry music makers are ready for new adventures in the next quarter-century!